Signlex Free is the free and limited version of Signlex containing 99 signs. 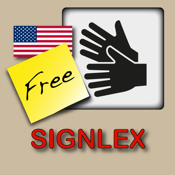 Signlex is a signing lexicon with American Sign Language (ASL). The uniqueness of Signlex is that you can choose your own language to get the words translated directly to ASL. The full version displays video and description of over 2000 words, with almost two hours of filmed material. 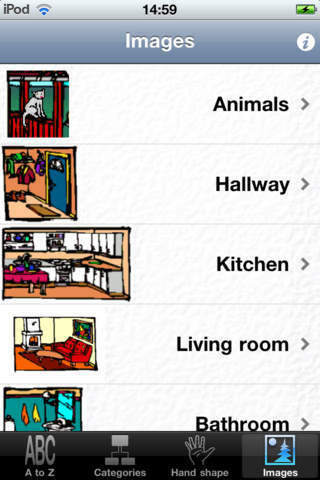 The words are searchable and also arranged in categories and hand shapes. Children and the illiterate can also search through some movies based on images instead of text. This app is as an excellent tool for those who want to learn ASL signing without any knowledge of English. If you want to use the app in tuition you can plug in your iPhone, iPod, or IPAD to a TV or projector to play the clips (requires iPhone4, iPod touch (Gen. 4) or iPad/iPad2). Signlex need no internet connection to work because all the movies come with the installation. Since the app is universal, it works equally well on both the iPhone, iPod and iPad. Supported languages​​: English, Swedish, Spanish, French, German, Italian and Simplified Chinese.